countless colors. Plus, by adding the watercolor effect it's easy to create stunning effects and we believe your work will be amazing. These pens have similarities and differences. Similarities: Brush tip. Water-based. Blend-able. Used for arts and crafts. (1) Tip. Real brush pens have more softer and flexible tips. (2) Color. Real brush pens have brighter colors than brush pens and higher quality pigmentation. (3) Blend-ability. Real brush pens are more blend-able and the tips are well-proportioned. Our Real brush pens have transparent caps and colored tips to distinguish brush color and our real brush pens have color-matched barrels. Compared to others, ours are brush colors easier to distinguish. Pens are lined up compactly and stored in a see-through plastic box. No hassle, no mess and portable storage case make it suitable to take them on the go . Delicate packaging also makes it perfect as a gift. Children, friends and family members will be excited when they receive this amazing gift. Acid-free and non-toxic, conforms to safety certificates: EN71 . PREMIUM REAL BRUSH SET: This 52 pack contains 50 premium quality vibrant real brushes and 2 bonus all purposes water brush pens. Real brush pens are water based, easy to blend, fade-proof, non-toxic and acid free. REAL BRUSH TIP: Flexible nylon brush tips that provide steady and consistent ink flow make it easy to control your brush strokes which can range from broad to fine lines and won't deform. 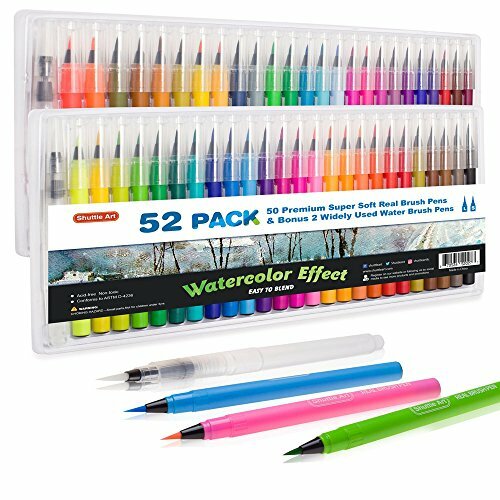 ASSORTED COLORS: While using water brush pen included, novices or artists can create more than 50 color options and add watercolor effect to their work, eg. Adult coloring books, Drawing , Painting, Sketching, Manga, Comic, Calligraphy and more. COLOR-MATCHED BARREL: Ink within the brush pen is same hue as the pen barrel. Color-matched barrels help to distinguish colors and further save time to focus on a project. SECURITY ASSURANCE: Conforms to EN71. It's safe and suitable for all ages. 100% SATISFACTION GUARANTEE and BETTER THAN MONEY BACK SERVICE. Take action and get yours now!